Public policy should strive to act in the best interests of children. However, there are 2 million children being raised by LGBT parents--children from all walks of life, living in almost every U.S. county--who have become collateral damage of ideology and laws designed to hurt LGBT people. All Children Matter is the most comprehensive look to date at these children; how they are failed by society, government and the law; and how simple changes to unfair laws can begin to ensure we are giving all children the chance to reach their full potential. 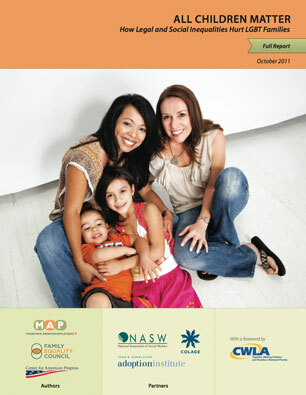 This 125-page Full Report contains expanded discussions, detailed tables and figures, full citations, references, attributions and clarifications that paint one of the most comprehensive portraits to date of laws and policies that fail to protect children with LGBT parents, as well as the most detailed recommendations for addressing these inequalities. Also available: a Condensed Version that provides a high-level understanding of the Full Report, and a stand-alone version of the Executive Summary.